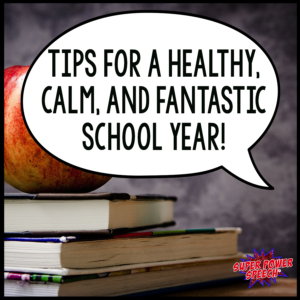 Tips for a calm, healthy and fantastic school year! Almost everyone is officially now “back to school”… how are you feeling about that? Excited? Exhausted? Somewhere in between? I know there have been a million “back to school” posts over the years, so I wanted to compile some great advice and tips and for your inner wellness. If you are not centered and calm, then this will not be a great year. And I want you to have a fantastic year! In the comments, let me know which of these resonates with you most! Dear School Year: In this post from last year, I explained what I was (and will continue to!) going to do to make it a great year. Some of the things I wanted to embrace were mindfulness (haven’t mastered that one yet! ), relationships (still working on that one too), and leisure. Strangely enough, although my life seemed to get a million times more busy last year than any other year, I did feel like I had more leisure than ever before. I read 100 books. I ran 2 half marathons. I traveled, a lot. So, I’m going to focus on mindfulness and relationships this year. Mandi, from Panda Speech, goes over some great advice on setting herself up for success. Her ideas include actually taking a lunch break (I still don’t do this…but that is my choice to get out of school earlier), staying healthy with lots of water and bathroom breaks, using a planner (I cannot stress enough how awesome planners can be for your life) and staying connected (sounds like me, right?). Start With the Finish in Mind: I love this reminder from Smart Mouth SLP! If we start the year imagining how we want it to end, then plan for it, we really can have a sense of inner peace at the beginning of the school year. The First Week- Eat Your Toads and Keep Everything Visible: All Y’all Need tells us to do the hardest thing first. As much as I hate to admit that this works, it really does. When you get that hard thing done (whether it be the hardest thing of the day, month, or year) right away, the rest of the time can float by care-free! If you want to read a book about this concept, this short book (Amazon affiliate link) is quite good: Eat that Frog. 21 Great Ways to Stop Procrastinating and Get More Done in Less Time. My favorite tip from the Scholastic blog is to play quiet music in your room. How relaxing! Back to School Advice and Tips for New Teachers: This post reminds us to keep a well stocked emergency drawer. No, I’m not just talking about bandaids. I mean, keep it full of chocolate (yay! ), Advil (yay! ), and notes of encouragement. You need some emergency TLC from time to time! Surviving the First Week: Mia, from Putting Words in Your Mouth, encourages something in this post that I do ALL the time: talk to yourself. You can do this! You got this! You go girl/guy!